5 of the 30 STI constituents have released earnings over the first two weeks of April, while the remainder are expected to report their quarterly or FY results in the coming weeks. Of the 6 STI constituents that have reported their latest quarterly results, five achieved positive YoY percentage growth in quarterly net profits. They are Hutchison Port Holdings Trust, Ascendas REIT, CapitaLand Commercial Trust, SGX and Keppel Corp. SPH unveiled a YoY percentage decline in earnings for the fiscal quarter ended 28 February. In the 2018 year-to-date, the 30 STI constituents have averaged a total return of 0.9%, bringing their total return over the last 12 months to 11.9%. 5 of the 30 constituents of the benchmark Straits Times Index (STI) have released their earnings over the first two weeks of April, while the remainder are expected to report their quarterly or FY results in the coming weeks. Of the 6 constituents that have reported their latest quarterly results, five achieved positive YoY percentage growth in quarterly net profits. 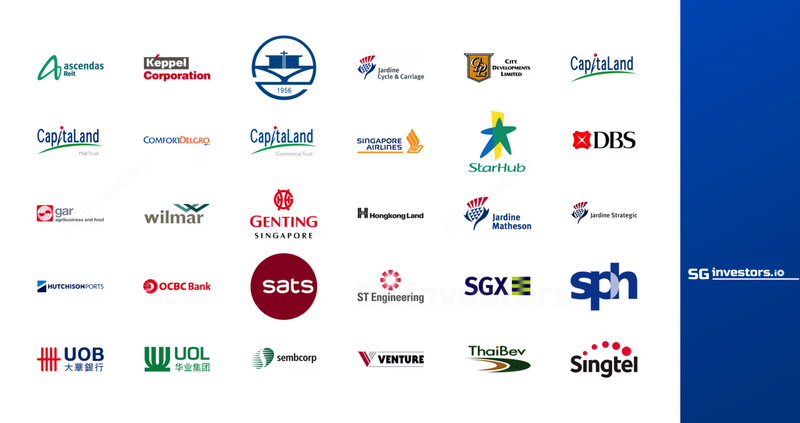 They are Hutchison Port Holdings Trust, Ascendas REIT, CapitaLand Commercial Trust, SGX and Keppel Corporation. SPH, however, unveiled a YoY percentage decline in earnings for the fiscal quarter ended 28 February. Investors can subscribe to the weekly Economic Calendar (click here) for confirmed schedules of other STI component stocks closer to the event. The table below details the confirmed, estimated and released dates of earnings reports by STI constituent stocks, sorted by date. In the 2018 year-to-date, the 30 STI constituents have averaged a total return of 0.9%, bringing their total return over the last 12 months to 11.9%. They have also averaged a price-to-earnings ratio (P/E) of 17.6x, below their five-year average of 18.6x, and a dividend yield of 3.4%. The table below shows the comparative performances of the STI constituents, sorted by market capitalisation. * SGD equivalents shown for Jardine Matheson Holdings, Jardine Strategic Holdings, Hongkong Land Holdings and Hutchison Port Hldgs Trust traded in USD. Source: SGX StockFacts & Bloomberg (Data as of 23 April 2018). On 19 April, 2018, Keppel Corp reported 1QFY18 net profit of S$337 million, up 34% YoY, driven by contributions from its property division, which recorded a 298% YoY increase in earnings for the first three months of 2018. Group revenue for the quarter grew 18% YoY to S$1.47 billion, mainly due to higher Property and Infrastructure revenues. Keppel Corp CEO Mr Loh Chin Hua noted that the Group’s resilient outlook is underpinned by its multi-business strategy, and that it aims to pursue new markets to build stable and recurring incomes. For the full financial results, click here. On 20 April, 2018, Singapore Exchange reported a 3QFY18 net profit of S$100 million, up 21% YoY and hitting new 10-year record. Revenue grew 10% YoY to S$222 million, reaching the highest level since its public listing in 2000. Looking ahead, SGX CEO Loh Boon Chye highlighted that SGX would continue to build on its multi-asset offering and increase servicing and marketing efforts across its domestic and international client base. It would also strengthen its network of strategic partnerships and alliances globally. For the full financial results, click here. On 23 April, 2018, Ascendas REIT reported a distribution per unit (DPU) of 16.0 Singapore cents for the financial year ended 31 March 2018, up 1.6% YoY. Net property income rose 3.0% to S$629.4 million, while gross revenue gained 3.8% to S$862.1 million. Looking ahead, the trust highlighted that the global outlook is still subjected to downside risks, including growing trade tensions between US and China. Despite volatile market conditions, Ascendas REIT will continue to adopt a prudent capital management strategy to achieve an optimal financial position and mitigate impact of rising interest rates. For the full financial results, click here.